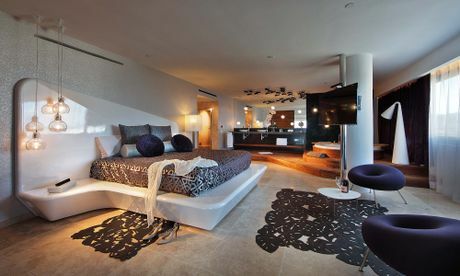 Main bedroom features a King Size bed and a second Flat-screen TV 55"
**Only booking on this site. Free transportation to and from the airport. It is required to make the request of the transfer to Experience department (vip.services@ushuaiabeachhotel.com) 24 hours before the arrival of your flight. Subject to availability. ***All guests staying at Ushuaïa have free access to the amazing hotel parties. Sinta-se na cima do mundo e domine as vistas do impressionante cenário do The Ushuaïa Club, a maravilhosa Cidade Alta de Ibiza e o horizonte do mar da Praia d'en Bossa. O seu exclusivo serviço de quarto coloca à sua disposição tudo o que pode necessitar.